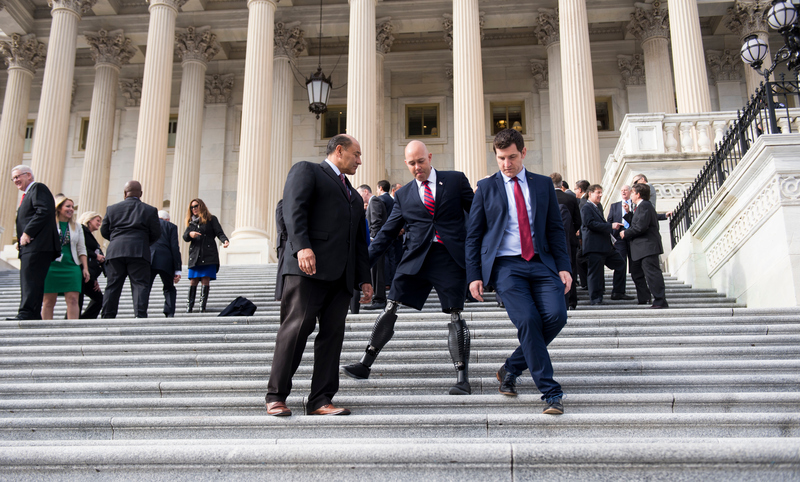 Freshman Republican Rep. Brian Mast of Florida, 36, talks to HOH about how he lost his legs, why he decided to fight with the Israeli military, and advice he received from his father. Q: Tell me about the day you got injured. A: I was injured Sept. 19, 2010. We were essentially going out into an area where … there was primarily nothing but military-age males — no women, no children. We know exactly that they’re the wrong people and what they’ve been up to. We came to a spot on the battlefield that I knew there were explosive devices buried. There had to be, based on my threat assessment. I looked for them and one of them, I just simply didn’t find it until, ultimately, I stepped on it and it was an explosion that ended up taking two legs and a finger and opening up a whole new world of life about a week later when I woke up in Walter Reed Army Medical Center. One of the more surreal things that I remember very specifically, when I woke up, there I was laying in this hospital gurney and looking down at the end of this gurney where I should see my feet sticking up, but didn’t. There was an Army medic named Josh Campbell — a guy that I’d gone to middle school with, high school with, but I had no idea he was in the Army. He realized this is Brian Mast. And he was able to reach back out to Michigan, to my family. Got the number for my wife and was able to tell her everything that was going on with me. He asked my wife to email him a photo of her … and our six-month-old son at the time. And he printed out that photo … and he taped it to that flat part at the end of a hospital gurney so whenever I woke up, the first thing that I would see would be this picture of my wife and my son staring back at me. Q: What were the biggest challenges in going back to day-to-day life? A: When I woke up in the hospital, my single biggest goal was to get out of the hospital as quick as I possibly could. For me, that meant that I was doing physical therapy eight hours a day. It wasn’t a challenge to have the desire to do it, the challenge was physically learning how to walk again with my prosthetic legs. I’m amputated a couple inches above where my kneecaps were. The first set of prosthetics that I had were nothing more than a shoe right where my amputation was. So you’re building yourself up. It was just going through all of this to get to the point that I could be back to that normal routine of life. Q: Any advice that you got while recovering that you’d pass on to someone in your situation? Q: Why did you decide to volunteer alongside the Israel Defense Forces? A: That summer of 2014, I was up at Harvard. I was there for a summer semester. All the news was what was going on in Israel with Operation Protective Edge. We would go out to the Boston Commons to let our kids play every night. One of those nights, as there were a lot of protesters out there, some of these protesters started harassing me and my wife and our family. They were out there to protest Israel and they started harassing me for being a U.S. service member. As I tell people, that ball cap sitting over there that says Army Rangers [points to a cap on a table in his office], I always have that on and I don’t have any legs. When I got home that night, I told my wife I didn’t know what it was going to look like yet but I was going to find a way, I was going to go and show my support for Israel and those parallel values that they represent and ultimately, I went and served with their military. Q: What has been the hardest transition coming to Congress? I came from a world where when you say something, you understand that your words have weight, and you say things that you truly believe. Favorite song: My Pandora is usually set to Alabama radio or Johnny Cash radio. Closest to in Congress:Jason Smith, Markwayne Mullin, Steve Russell, Liz Cheney, Scott Taylor, Don Young.